Parlor gui​​​​tars are named after the rooms they were often used in throughout the 19th and 20th century. Parlor guitars are like smaller traditional guitars, though no exact standards have been accepted to distinguish them from traditional concert guitars. Traditionally, parlor guitars have referred to guitars that are smaller than size 0 concert guitars that are offered by The Martin Guitar Company. There are many options available for customers looking to purchase a parlor guitar. Some of the most expensive parlor guitars on the market cost between $3000 and $4000. Yet, there are also extremely cheap parlor guitars available, costing less than $200. In this article, we review the best parlor guitar under $1000, specifically the Cordoba C9 parlor guitar. We first give an overview of this parlor guitar, emphasizing its benefits and drawbacks. Finally, we end with our thoughts on the future of the parlor guitar market. 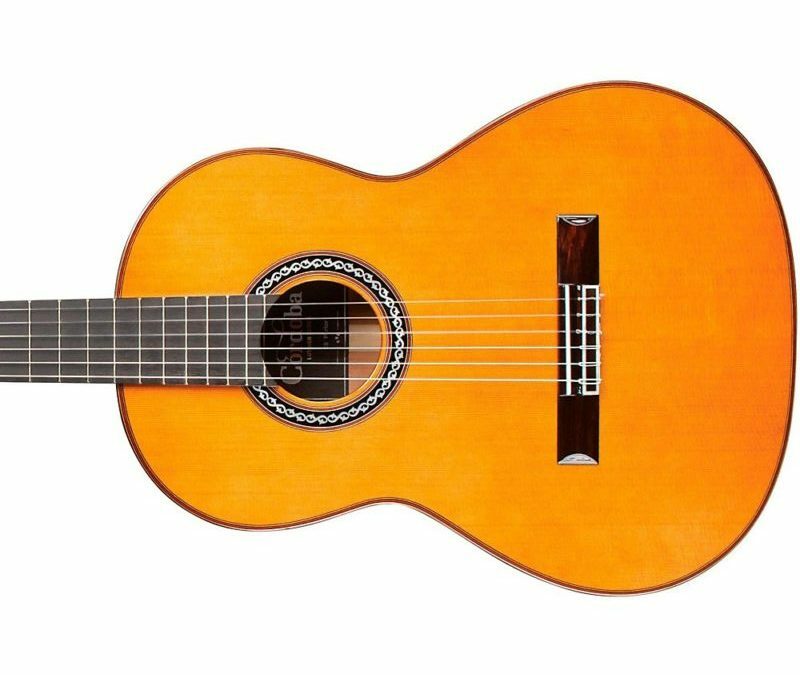 The Cordoba C9 Parlor guitar can be purchased for $869 on Amazon. The top of this parlor guitar is made from solid Canadian cedar wood while the back and sides are made from solid African mahogany wood. These are very durable materials that give this parlor guitar a long life. The Cordoba C9 parlor guitar has a reduced 7/8 body size and 50mm nut width. Its total length is 38 inches. This parlor guitar also features a rose​​​​tte encircling the sound hole, which gives the instrument a vintage, early 20th century feel. Additionally, this Cordoba C9 parlor guitar comes with a polyfoam case. After scavenging the web for parlor guitars under $1000, this Cordoba C9 parlor guitar stood out as the best at this price point due to a number of benefits and features. One of the main benefits of this parlor guitar is that users also get an accompanying case. This makes the instrument very portable and helps protect it over a long period of time. Many parlor guitars don’t offer this bonus, so this is definitely a distinguishing feature of the Cordoba C9 parlor guitar. The Cordoba C9 parlor guitar is ideal for intimate performances when you need an all-wood guitar to create warm tones, and rich, earthy sounds. This can only be achieved by a parlor guitar made from combination of cedar and mahogany. Many customers claim that this mix results in an ineffable synergy that pulses through every performance. This parlor guitar would be perfect for either a beginner or a professional, though the latter are more likely to use it. Ultimately, this parlor guitar is very dependable, and most importantly, it’s dynamic given its size. This is a great traveling guitar if you want to remain as light as possible. Alternatively, many professionals carry multiple parlor guitars with them when they are touring. Their small size facilitates practicing and training since they are so easy to pick up and put down. This is one of the larger parlor guitars available. This gives it the familiarity of a larger concert guitar while also offering the ease of use of a smaller instrument. Perhaps the most distinguishing benefit of the Cordoba C9 Parlor guitar is the Spanish fan bracing that it features. This bracing results in a responsive soundboard as well as vibration throughout the entire body of the guitar. It allows the instrument to produce warm, rich tones and a much stronger bass response. Despite these benefits, the Cordoba C9 Parlor guitar is not a perfect instrument by any means. As mentioned above, the Cordoba C9 parlor guitar is quite large when compared with the smallest parlor guitars available. Some customers dislike this size, desiring the most portable, smallest guitar possible. Many customers claim that the Cordoba C9 parlor guitar feels very similar to a standard sized concert guitar. Yet, many people purchase the Cordoba C9 due to its label as a parlor guitar. They are often disappointed when it doesn’t feel as small as they anticipated, feeling instead like a slightly smaller concert guitar. Furthermore, while the cedar and mahogany wood used to construct this instrument is certainly durable and earthy, many of the best parlor guitars on the market use rosewood and spruce. These materials can result in a more nuanced performance every time you pick up the parlor guitar. Additionally, some customers have lamented the lack of colors and styles available for purchase within this Cordoba line of parlor guitars. Some guitar manufactures allow users to customize the guitar with various symbols and colors. Cordoba does not offer this ability, which is a limitation of their product. Ultimately, many customers claim that the rosette featured around the sound hole is not worth the price hike that it likely resulted in. Many companies use design features like this in order to warrant a higher price. This is not to say that the aesthetics of an instrument has no influence on the sound produced. In fact, we think quite the opposite is true, namely that the visual personality of the instrument plays an important role in impacting the player’s performance. We are merely saying that guitar companies should provide customers with the bare bones when it comes to the visual nature of the product. Many customers want guitar companies to merely focus on construction, design, and quality and leave the final aesthetic touch up to them. This allows them maximum control over their musical equipment. We think the best parlor guitars under $1000 will be made from only one or two pieces of wood to maximize their durability and design. The Cordoba C9 parlor guitar uses cedar and mahogany, but rosewood and spruce are also common within the parlor guitar industry. The more effort that a company puts into finalizing each product, the more that product will typically cost. In this sense, the Cordoba C9 parlor guitar is a meticulously constructed guitar that features homage to the Spanish style of bracing that used to be more common. Additionally, it uses Spanish heel construction to ensure that the guitar vibrates as one piece. These unique touches allow customers to receive a truly vintage product that is simultaneously modern and innovative. This is a rare combination that many guitar companies cannot match. Some modern guitars look too modern and feature no portal on the history of their development. Alternatively, some modern guitars look too antiquated and don’t offer a proper update for present times. With the Cordoba C9 Parlor, you get the best of both of these worlds. Furthermore, the unique rosette featured on the guitar as well as the accompanying case are nice touches. Ultimately, Cordoba is trying to ensure that each customer has everything they need in order to proudly assume the identity of a musician. We understand why some customers might not like the rosette but don’t think it’s a critical issue. We think guitar manufacturers are going to continue to play around with funky sizes and shapes when it comes to guitars. This could entail both smaller parlor guitars or perhaps even larger guitars. We think that eventually, customers will crave new ways to create music. This will eventually lead to guitar companies innovating new products. Since the sound of an instrument is intimately related to its size and shape, we think new forms are on the horizon for guitars. We can imagine parlor guitars of the future that still retain their small length but have a totally different design process. This design process wouldn’t result necessarily in radical dimensions, but it would allow the customer to finetune the specifications of their instrument. Ultimately, we think that purchasing an instrument could eventually be similar to purchasing clothes. We think every future customer will demand that their instrument be tailored to their body and unique preferences. In this sense, parlor guitars might disappear from the market entirely, as each customer personally controls the dimensions of their instrument. Of course, some users might want variations in sizes within their arsenal. But, each size and shape would be so customized by the player that no guitar would represent a divergence or minority. Modern parlor guitars can be belittled for their unassuming appearance when compared to concert guitars. But, in the future, as we discover the intimate connection between design and performance, smaller guitars might become the norm. Either the concept of parlor guitars will be forgotten or it will be applied to even smaller guitars, or perhaps extremely large guitars. Whatever is being used in the receptive parlor rooms of celebrity mansions will be our criteria in the future, perhaps. Ultimately, we think parlor guitars will continue to be popular in the future, and we see Cordoba as leading the way in this industry.